Introduction Recently, we showed that the length of cardiac mucosa in healthy volunteers correlated with age and obesity. We have now examined the immunohistological characteristics of this expanded cardia to determine whether it may be due to columnar metaplasia of the distal oesophagus. Methods We used the squamocolumnar junction (SCJ), antral and body biopsies from the 52 Helicobacter pylori-negative healthy volunteers who had participated in our earlier physiological study and did not have hiatus hernia, transsphincteric acid reflux, Barrett's oesophagus or intestinal metaplasia (IM) at cardia. The densities of inflammatory cells and reactive atypia were scored at squamous, cardiac and oxyntocardiac mucosa of SCJ, antrum and body. Slides were stained for caudal type homeobox 2 (CDX-2), villin, trefoil factor family 3 (TFF-3) and liver–intestine (LI)-cadherin, mucin MUC1, Muc-2 and Muc-5ac. In addition, biopsies from 15 Barrett's patients with/without IM were stained and scored as comparison. Immunohistological characteristics were correlated with parameters of obesity and high-resolution pH metry recording. Results Cardiac mucosa had a similar intensity of inflammatory infiltrate to non-IM Barrett's and greater than any of the other upper GI mucosae. The immunostaining pattern of cardiac mucosa most closely resembled non-IM Barrett's showing only slightly weaker CDX-2 immunostaining. In distal oesophageal squamous mucosa, expression of markers of columnar differentiation (TFF-3 and LI-cadherin) was apparent and these correlated with central obesity (correlation coefficient (CC)=0.604, p=0.001 and CC=0.462, p=0.002, respectively). In addition, expression of TFF-3 in distal oesophageal squamous mucosa correlated with proximal extension of gastric acidity within the region of the lower oesophageal sphincter (CC=−0.538, p=0.001). Conclusions These findings are consistent with expansion of cardia in healthy volunteers occurring by squamo columnar metaplasia of distal oesophagus and aggravated by central obesity. This metaplastic origin of expanded cardia may be relevant to the substantial proportion of cardia adenocarcinomas unattributable to H. pylori or transsphincteric acid reflux. The length of the cardiac mucosa at the gastro-oesophageal junction is known to increase with age and central obesity. However, the mechanism of this and its relevance to the increasing incidence of adenocarcinoma at this site in subjects without reflux disease are unknown. In healthy volunteers without evidence of GORD, we have found that cardiac mucosa very closely resembles non-intestinal metaplasia Barrett's mucosa immunohistochemically and with respect to intensity and nature of inflammatory infiltrate. We also found expression of markers of columnar differentiations (trefoil factor family 3 and liver–intestine cadherin) in most distal oesophageal squamous mucosa, which correlated with central obesity and proximal extension of gastric acidity within the lower oesophageal sphincter. Our findings support expansion of cardia arising by squamocolumnar metaplasia of distal oesophagus and aggravated by central obesity. This metaplastic origin of the cardia may be relevant to the high incidence of adenocarcinoma at this anatomical site. In the West, the gastric cardia and gastro-oesophageal junction (GOJ) have a high incidence of adenocarcinoma, which is similar to or greater than the rest of the stomach and oesophagus.1 These junctional cancers share epidemiological characteristics with more proximal oesophageal adenocarcinoma, but have a weaker association with GORD, the main aetiological factor in oesophageal adenocarcinoma.2 Only 29% of Western patients with junctional cancers have reflux symptoms compared with 16% of controls.3 The aetiology of junctional adenocarcinoma and the role of reflux in its development remain unclear. Chandrasoma8 propose that cardiac mucosa is a response to reflux causing columnar metaplasia of the squamous mucosa of the most distal oesophagus, and is therefore a form of ultra-short Barrett's oesophagus. In neonates, the cardiac mucosa is <1 mm in length but lengthens with age.9 However, mechanisms by which the cardiac mucosa may expand in subjects without evidence of reflux are unclear. We recently studied the cardiac mucosa in 58 healthy volunteers without reflux disease or H. pylori infection and found it inflamed in all subjects.10 In addition, the length of the cardiac mucosa was positively associated with age and central obesity. None of the subjects had evidence of traditional reflux 5 cm above the upper border of the lower oesophageal sphincter (LOS), but central obesity was associated with gastric acid extending closer to the upper border of the LOS. Based on these observations, we hypothesised that acid reflux onto oesophageal squamous mucosa normally within the distal sphincter was causing columnar metaplasia promoted by central obesity. As there was no evidence of traditionally defined transsphincteric reflux, we refer to this phenomenon as intrasphincteric reflux. To test the hypothesis that much of the cardiac mucosa in subjects without traditional GORD may be established by columnar metaplasia, we have compared immunophenotyping of cardiac mucosa with other upper GI mucosae, that is, oesophageal squamous mucosa, gastric body and antral mucosa in the same healthy volunteers and with classical Barrett's mucosa with and without IM in other subjects. We have also correlated any changes with obesity indicators. Our observations are in keeping with cardia proximal extension arising by columnar metaplasia of oesophageal squamous mucosa, even in subjects without evidence of traditional reflux, and of the process being accentuated by central obesity. The healthy volunteers included in this study had participated in our earlier study of central obesity and length of cardiac mucosa.10 Previous or current proton pump inhibitor (PPI) use (ever) or ever-seeking medical attention for heartburn symptoms or complications of GORD were exclusion criteria. Participants completed a questionnaire about reflux symptoms; 35 participants had none in the two months prior to taking part; 13 had symptoms less than once per month and 8 less than once per week. Only six had more than one symptomatic episode per week. None was taking H2 antagonists or PPIs. Each of the participants had undergone oesophageal pH metry as part of the earlier study10 and none had evidence of abnormal gastro-oesophageal acid reflux. Participants were also excluded if found to have hiatus hernia or Barrett's, or irregular Z line. Also, none of the participants had a history of peptic ulcer, H. pylori infection, malignancy or systemic disease. A two-stage biopsy orientation procedure was developed specifically for this project. In endoscopy room, biopsies were immediately placed in a plastic Petri dish on a piece of dental wax, which has a non-adherent surface and orientated flat on the luminal side. Isotonic aqueous 1 mg/mL Hyoscine N butylbromide (Boehringer Ingelheim GmbH) was applied to minimise contraction of biopsies and preserve length and shape. Orientated biopsy samples were transported on filter paper in buffered formalin and embedded in agar to preserve orientation during tissue processing and embedding. Blocks were cut on edge at 3 μm thickness. Formalin-fixed paraffin-embedded (FFPE) sections cut at 3 µm floated out on a water bath at 56°C were collected on silane-coated glass slides, put in a metal rack and dried at 60°C in a fan-assisted oven for 1 h. Slides were then transferred to plastic slide racks for use with the DAKO autostainer with reagents from the DAKO EnVIsion FLEX+ Mouse High pH kit (DAKO K8002). Deparaffinisation and rehydration were followed by heat-induced epitope retrieval with DAKO High pH EnVision FLEX Target Retrieval Solution (1:50 in deionised water). The slides were placed in a retrieval bath heated to 85°C, then 100°C for 20 min, then 70°C for 15 min before transfer to phosphate-buffered saline (PBS) at room temperature for 5 min. All staining was carried out in the DAKO autostainer. Endogenous peroxidase was blocked using DAKO EnVIsion FLEX peroxidise blocking reagent for 5 min. The sections were then washed in PBS for 5 min. After titration and optimisation, the primary monoclonal antibodies were diluted in DAKO diluent (table 1). Antibodies were incubated for 30 min, then washed in PBS for 5 min. A negative control was diluent alone for each run. A polymer-based detection system was used: EnVIsion FLEX/HRP. Sections were incubated for 30 min, then washed for 5 min in PBS. Visualisation used diaminobenzidine (DAB) (20 drops concentrate/20 mL of DAB substrate buffer) applied twice×5 min. After washing in PBS (5 min), DAB staining was enhanced in 0.5% copper sulfate/0.9% saline solution for 5 min. Sections were counterstained with haematoxylin, then coverslipped. In the earlier study, all healthy volunteers had pH metry fasting and postprandially in both supine and upright positions.10 Using a custom-made high-resolution pH probe with 12 antimony pH electrodes (Synectics Medical, England, UK), acid exposure was determined at the following points: (i) the traditional site 5 cm above the upper border of the LOS, (ii) the sensor 1 cm proximal to the pH transitional point and (iii) the sensor 1 cm distal to the pH transitional point. In sections of gastric antrum, body and GOJ (cardiac, oxyntocardiac mucosa and Barrett’s), the percentage of glandular cells having positive immunostaining was estimated by eye, with all mucosal epithelial cells (surface, foveolar and glandular) being the relevant denominator. In oesophageal squamous epithelium, the only positive differentiation markers were TFF-3 and LI-cadherin. As their expression was entirely restricted to the basal and suprabasal layers, these cells (ie, those cells not yet showing obvious squamous differentiation) were taken as the relevant denominator. Positive immunostaining was represented by unequivocal brown DAB signal. In any one biopsy, all the mucosa of a particular phenotype were assessed using medium (×10, ×20) and high-power (×40) objectives. In the case of Ki-67, where there was >2 mm of squamous mucosa, separate scores were assigned for proximal and squamous epithelium. Biopsies were scored semiquantitatively for intensity of inflammation. For biopsies of the GOJ, each mucosal subtype present was analysed separately. Scores of 0–3 were given for inflammation, where 0=not inflamed, 1=mild inflammation, 2=moderate inflammation and 3=severe inflammation. Acute inflammation was defined by the neutrophil polymorphonuclear leucocytes and for chronic inflammation defined by mononuclear cell infiltration. Reactive atypia in squamous epithelium was defined as features associated with reflux oesophagitis, that is, basal layer thickening (>15%), connective tissue papillae >50% mucosal thickness, congestion and decreased surface maturation. In glandular mucosa, mucin depletion, reduced maturation towards the mucosal surface and increased cell proliferation are all reactive features, provided criteria for a diagnosis of dysplasia are not met. Scoring was performed independently by two persons (MD, JJG) blinded to clinical characteristics of the volunteers. Agreement was checked using a kappa test, which ranged between 0.74 and 0.89 (p>0.01). In case of discrepancy between two observers, they reviewed the slides jointly for the second round and agreed on the final scores. Results are presented as either mean (+SD) or median (+IQR), based on symmetry of data distribution. Comparisons between groups were made using Mann–Whitney U test or independent groups T test, if appropriate. To compare two paired groups, we used related samples T test or related samples Wilcoxon signed-rank test, where appropriate. For correlations between continuous variables, Spearman's rho bivariate correlations were used with significance taken at p<0.05. Samples across the GOJ, antrum and body were available for 28 women and 26 men. IM of cardia was observed in one of these subjects (man), and this subject was excluded from further analysis. The mean (SD) ages of women and men were similar, being 47 (16) years for women and 50 (16) for men, p=0.404. The mean (95% CI) for body mass index (BMI) and waist circumference (WC) were 27 (19–36) kg/m2 and 93 (73–115) cm, respectively. The Barrett's oesophagus comparison patients (12 men, 3 women) had a mean (SD) age of 58 (14). Acute and chronic inflammation scores were maximal for cardiac mucosa and higher than proximal or distal adjacent tissues (all p values <0.001) (table 2). Inflammation in the cardiac mucosa was equivalent to that in Barrett's mucosa with or without IM (table 2). Reactive atypia (an indicator of mucosal stress) was greater in cardiac mucosa than more distal gastric mucosae, and similar to that in Barrett's with or without IM (table 2). A high level of reactive atypia was also observed in the distal squamous mucosa. There was no CDX-2 immunostaining of oesophageal squamous mucosa, gastric oxyntic or oxyntocardiac mucosa. A small number of glandular cells (1%, IQR 0–3%) showed positive staining in cardiac and antral mucosa. In biopsies from Barrett's mucosa, CDX-2 was strongly expressed (90%, IQR 50–90%) in glandular areas with IM but much fewer in the absence of IM (5%, IQR 1–5%, p=0.022) (table 3). There was no immunostaining for villin in squamous mucosa. There was substantial expression in cardiac mucosa (30%, IQR 10–70%) with a sharp decrease in oxyntocardiac (5%, IQR 0–10%) and oxyntic (1%, IQR 0–1%) mucosae. Antral mucosa (90%, IQR 81–90%) and Barrett's mucosa with IM (90%, IQR 86–95%) both expressed villin even more strongly than cardia (p<0.001 for both). Villin expression in non-IM of Barrett's mucosa was lower at 25% (IQR 10–40%), similar to cardiac mucosa (p=0.425). In oesophageal squamous mucosa, a minority mean 4% (SD 6%) of basal layer cell were distinctly positive for TFF-3 (figure 1). This was significantly lower than its expression in cardiac mucosa (54%, SD 37%, p<0.001). TFF-3 expression decreased to 26% (SD 20%, p<0.001 vs cardia) in oxyntocardiac and to 12% (SD 19%, p=0.003 vs cardia) in oxyntic mucosae. Again in antral mucosa, a high proportion (47%, SD 25%) of cells expressed TFF-3 and similar to cardia (p=0.489). In Barrett's mucosa, TFF-3 expression was maximal in IM (89%, SD 3%), which was significantly higher than cardia (p=0.001). Non-IM Barrett's mucosa expresses TFF-3 at levels similar to cardia (69%, SD 9, p=0.352). Top row: (A) low-power view of a biopsy from the squamocolumnar junction of a volunteer showing biopsy length and orientation. (B) Higher-power view of squamocolumnar junction of another volunteer showing inflammation and reactive changes to squamous and glandular mucosa. Middle row: liver–intestine (LI)-cadherin, immunohistochemistry. (C) Strong expression by Barrett's mucosa with intestinal metaplasia (IM). (D) Occasional positive cells in non-IM Barrett's mucosa. (E) Occasional positive cells in cardia mucosa in a volunteer. (F) Basal Li-cadherin-positive cells in squamous mucosa in a volunteer. Bottom row: trefoil factor family (TFF)-3 OJC. (G) Strong expression by Barrett's mucosa with IM. (H) Interface between Barrett's mucosa with IM and non-IM Barrett's mucosa. (I) Cardiac mucosa in a volunteer. (J) Basal TFF-3 positivity in squamous epithelium next to cardia in a volunteer. The distal oesophageal squamous mucosa showed strong LI-cadherin immunostaining in 7% (SD 6%) of basal and suprabasal layer cells (figure 1). There was greater staining in cardia (14%, SD 11%), which gradually decreased to 10% (SD 7%) (p<0.001 vs cardia) in oxyntocardiac and then to 5% (SD 4%) (p<0.001 vs cardia) in oxyntic mucosae. Expression of LI-cadherin in antral mucosa was 18% (SD 7%), similar to cardia (p=0.594). In Barrett's biopsies, while sections with IM expressed LI-cadherin strongly (65%, SD 37%) (p<0.001 vs cardia) non-IM sections expressed lower levels (13%, SD 10%) similar to cardia (p=0.465). Except weak and superficial expression of MUC1, extending to a median of 1% (IQR 0–1%), none of the other antibodies detectably expressed in squamous mucosa of the SCJ. MUC1 was expressed in 5% (IQR 1–8%) of cells in cardiac mucosa, and the expression increasing distally to 15% (IQR 9–22%) in oxyntocardiac (p=0.001) and 40% (IQR 8–65%) (p=0.028 vs cardia) in oxyntic mucosae. Antral mucosa showed 10% (IQR 5–50%) expression, slightly higher than cardia (p=0.035). There was no reactivity in Barrett's mucosa with IM, but non-IM Barrett's showed 3% (IQR 0–5%) expression, similar to cardia (p=0.063). MUC-2 was strongly expressed only in Barrett's mucosa with IM (90%, IQR 80–90), which was significantly higher than that of cardiac mucosa (p<0.001). MUC-5ac-positive cells were present in 50% (IQR 50–70%) of cardia and decreased in oxyntocardiac to 40% (IQR 30–40%) (p<0.001) and in oxyntic mucosae to 30% (IQR 25–60%) (p<0.001 vs cardia). In antrum, MUC-5ac was expressed in 55% (IQR 40–70%), which was similar to cardia. MUC-5ac was highly expressed in Barrett's with IM (90%, IQR 90–90%, p<0.001), but its expression in non-IM Barrett's was similar to cardia (60%, IQR 50–70%, p=0.927). Cardiac mucosa immunostaining was statistically indistinguishable from that of non-IM Barrett's mucosa with respect to six of the seven antibodies employed. CDX-2 was expressed by a slightly but significantly higher number of cells in non-IM Barrett's mucosa (1%, 0–3 vs 5%, 1–5). Cardiac mucosa differed from all the other upper GI epithelia by showing different characteristics with respect to at least two of the immunostains. As expression of Ki-67 appeared to vary across squamous mucosa of GOJ biopsies, we measured the variation of expression in 20 biopsies with >2 mm of squamous mucosa. In SCJ biopsies, expression of Ki-67 was maximum at the most distal squamous epithelium (39%), and decreased moving proximally (25%) and distally (20% in cardia) (p for trend <0.01) (table 4). Decreasing Ki-67 expression in the small distance between distal to proximal squamous epithelium within single biopsies was parallel to a decreasing median inflammatory score (mononuclear cells + polymorphonuclear cells) over the same distance (4.0 (IQR 3.5–5.0) vs 2.5 (IQR 2.0–3.0), p value <0.01). Correlation between proliferation (indicated by Ki-67) and inflammation at the SCJ was positive (Spearman's coefficient 0.510) and statistically significant (p=0.022) in the 20 samples with sufficient length of squamous mucosa in specimen. Ki-67 expression was highest in Barrett's mucosa with IM (75%, IQR 70–80) and lower in non-IM Barrett's at 40% (IQR 35–45) (p<0.01 for cardia vs Barrett's with IM and p<0.05 for cardia vs non-IM Barrett's). In squamous mucosa of the distal oesophagus, expression of TFF-3 and LI-cadherin was correlated with obesity (table 5). The TFF-3 expression was correlated strongly to WC (correlation coefficient (CC)=0.54, p=0.001), BMI (CC=0.58, p=0.001), subcutaneous fat thickness at lower abdomen (CC=0.39, p=0.020), average subcutaneous fat (CC=0.44, p=0.005) and intra-abdominal fat at a similar area (CC=0.48, p=0.002). These correlations remained significant or became stronger when adjusted for age and gender or age, gender and cardiac mucosa length (table 5). Expression of LI-cadherin also was correlated to WC (CC=0.51, p=0.001), BMI (CC=0.37, p=0.015) and subcutaneous fat thickness at lower abdomen (CC=0.34, p=0.039), and these correlations also became stronger when correcting for age, gender and cardia length. Expression of CDX-2, villin and Ki-67 in distal squamous mucosa was not correlated with obesity. None of the tested antibodies in cardiac mucosa correlated with obesity parameters (table 6). Expression of TFF-3 in the most distal squamous mucosa was inversely correlated with the location of pH transition point, relative to either upper border of LOS, or peak LOS pressure (table 7). The correlations were statistically significant in postprandial upright (CC=−0.422, p=0.005) and postprandial supine (CC=−0.538, p=0.001) positions for the location of pH transition points (relative to upper border of LOS). The inverse correlations of TFF-3 with the location of pH transition point (relative to peak LOS pressure) were significant in all positions except fasting upright. This indicated that TFF-3 expression within the distal oesophageal squamous mucosa correlated with more proximal extension of gastric acidity within the region of the LOS. There was no correlation between expression of TFF-3 in cardia and location of the pH transition point. There were no correlations between the location of the pH transition point within the LOS and other markers of glandular differentiation. There were no correlations between expression of any of the above makers and traditional oesophageal acid exposure at 5 cm above the upper border of the LOS. There is debate regarding the origin of cardiac mucosa in apparently normal individuals, and whether its expansion with age may be a result of columnar (glandular) metaplasia of distal oesophageal squamous mucosa. The findings of our current study support the cardia arising in this way as it shows an almost identical immunophenotype to non-IM Barrett's mucosa, which is considered to arise by metaplasia of the oesophageal squamous mucosa, induced by gastro-oesophageal acid reflux. Our study also provides evidence of changes at the SCJ aggravated by central obesity and consistent with mucosal stress caused by damage by gastric acid and leading to columnar metaplasia. 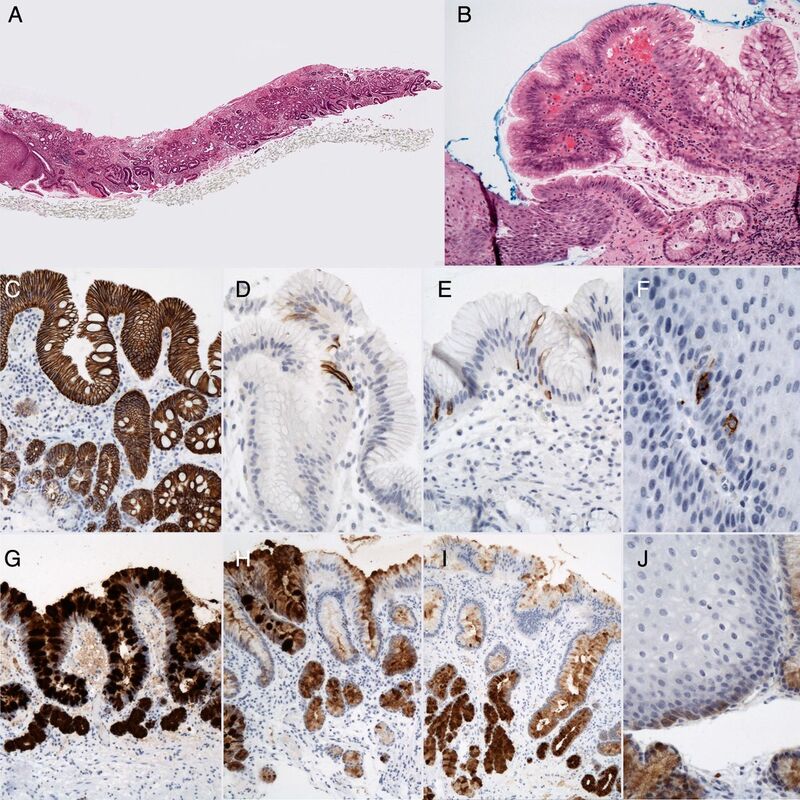 We found that cardiac mucosa showed identical staining to non-IM Barrett's mucosa for six of the seven immunohistological markers of differentiation of GI epithelium. The only marker showing a slight difference was CDX-2, which had a slightly lower median value for cardia versus non-IM Barrett's. In contrast, in IM Barrett's CDX-2 expression was much higher than either with a median of 90% (IQR 50–90). The slightly higher value in the non-IM Barrett's mucosa versus cardia might indicate some of the former starting to show evidence of progression to IM-type Barrett's. Vallbohmer et al22 have previously reported that Cdx-2 gene expression in cardiac mucosa lies between that of squamous mucosa and Barrett's mucosa. Unlike cardiac mucosa, the other gastric epithelia, that is, phenotypes, oxyntocardiac, oxyntic and antral, all differed from non-IM or IM Barrett's with respect to at least three of the immunostains. Both non-IM Barrett's and cardiac epithelium are known to develop and/or expand with increasing age, and the close similarity of cardiac and non-IM Barrett's with respect to markers of differentiation is consistent with them being acquired by a similar process. In long-segment Barrett's oesophagus, the mucosa is a patchwork of regions with intestinal and non-intestinal columnar metaplasia.23 Proximally, IM is most prevalent, whereas at the distal end, non-IM is more prevalent.23 Cardiac mucosa is at the most distal end of the oesophagus and therefore columnar metaplasia in this region would most typically be similar to non-IM rather than IM metaplasia. Glandular metaplasia of the oesophagus is regarded as an adaptation to the changing environment of the adjacent lumen. Predominance of IM at the proximal end of long-segment Barrett's oesophagus is consistent with this region being exposed to less acidic reflux and thus developing mucosa more typical of the small or large intestine where the environment is much less acidic than that of the stomach. In contrast, the distal end of the oesophagus in patients with Barrett's mucosa is exposed to levels of acidity similar to the stomach and therefore metaplasia similar to the antrum of the stomach may have an adaptive advantage. Previous studies have reported similarity between cardiac mucosa and non-IM Barrett's mucosa. However, our current study differs from those studies in two respects. First, our study included healthy volunteers in whom the absence of gastro-oesophageal acid reflux had been confirmed by pH metry, whereas previous studies have involved patients with typical reflux symptoms,24 reflux oesophagitis,25 Barrett's oesophagus 26 or oesophageal adenocarcinoma.27 Second, our current study has employed a more comprehensive panel of immunostains than the previous studies. Pereira et al used a panel of four immunostains (villin, sucrose isomaltae CK7 and CK20) and only the villin showed similarity of both mucosae.25 Chaves and colleagues used only antibodies against mucins (Muc-2, Muc-5ac and Muc-6).26 Lord et al used CK7, CK20 and DAS-1 as markers of Barrett's plus other antibodies to assess dysplasia, which was not our interest.27 Theisen et al28 used only Alcian blue to assess the presence of goblet cells in both mucosae. We believe our comprehensive panel of immunostains covered full ranges of cellular and histological changes in the cardiac and Barrett's mucosae and also in other types of interest in the upper GI tract. Cardiac mucosa also resembled Barrett's mucosa with respect to pattern and severity of inflammatory infiltrate. Acute and chronic inflammatory cell infiltrates in cardiac mucosa, IM and non-IM Barrett's mucosa were similar and substantially greater than in any other upper GI mucosae in our H. pylori-negative healthy volunteers. Likewise, reactive atypia, a marker of stress, was similar in cardiac mucosa, IM and non-IM Barrett's mucosa and greater than in any other upper GI columnar mucosae. The similarity with respect to inflammation, reactive atypia and markers of differentiation all support the two mucosae being acquired by a similar mechanism. If the expansion of the cardia is arising by gastric acid damaging the most distal oesophageal squamous mucosa and resulting in metaplastic change, then one would expect to see evidence of damage and possibly early metaplasia of the oesophageal squamous mucosa at the SCJ. We found that the inflammatory cell infiltrate and rate of epithelial proliferation were most marked near to the SCJ. We also observed evidence of expression of TFF-3 and LI-cadherin within the distal oesophageal squamous mucosa consistent with early columnar metaplasia or at least a wavering commitment to glandular differentiation. TFF-3 and LI-cadherin especially were expressed by a small number of basal and immediately suprabasal cells. This could indicate transient expression by stem cells or early daughter cells, not maintained in later generations of transit-amplifying cells. If such glandular differentiation was maintained, rather than being switched off, it would represent a possible pathway to glandular metaplasia potentiated by obesity. This evidence consistent with gastric acid damaging and inducing columnar metaplasia of the distal oesophageal mucosa was observed in healthy volunteers without evidence of traditional transsphincteric acid reflux. We have previously suggested that this may arise by acid refluxing up onto squamous mucosa within the region of the LOS but not traversing the sphincter.10 ,29 ,30 Consistent with this, we found a correlation between the proximity of the luminal transition point from acid to neutral pH and the degree of expression of both TFF-3 and LI-cadherin within the distal squamous mucosa. We have previously reported that the length of the cardiac mucosa in these same healthy volunteers correlated with age and central obesity. In this analysis of the immunohistology of the GOJ, we also observed associations with central obesity. In the distal oesophageal squamous mucosa, the expression of the markers of glandular columnar differentiation (TFF-3 and LI-cadherin) correlated with WC and this was strongest when corrected for age, gender and cardia length. This is consistent with central obesity promoting squamocolumnar metaplasia close to the SCJ by mechanically inducing acid reflux within the region of the LOS and possibly also aggravated by humeral factors related to central obesity. These immunohistological changes observed at the GOJ provide further support for gastric acid causing damage and columnar metaplasia of the distal oesophageal mucosa and providing a mechanism for the proximal expansion of cardiac mucosa related to age and central obesity. It should be emphasised that this process is occurring in healthy volunteers without any evidence of traditional transsphincteric acid reflux. This inflammation and metaplasia occurring at the SCJ in apparently healthy volunteers may be relevant to the high proportion of junctional adenocarcinoma that present in subjects without a history of reflux disease. We would like to acknowledge the kind contribution of all volunteers.
. Histologic definition and diagnosis of epithelial types in the esophagus and stomach. In: Chandrasoma PT, ed. Diagnostic atlas of gastroesophageal reflux disease: a new histology-based method. San Diego: Academic Press, 2007:61–111.
. CDX2 and Li-Cadherin expression in esophageal mucosa: use of both markers can facilitate the histologic diagnosis of Barrett's esophagus and carcinoma. Int J Surg Pathol 2010;18:330–7. Contributors MHD: histological assessment, data analysis and drafting manuscript. EVR: conducted clinical investigations. YYL: recruitment of volunteers. TH and RKF: technical assistance in histology. AAW: recruitment of volunteers and assisting clinical investigations. CO: scanning of histological slides. SAB and SLH: MRI assessment. JJG: principal histologist. KELM: conception of original idea, project leader. Funding This study was supported by a grant (CZB/4/709) from the Chief Scientist Office and NHS Endowment from Greater Glasgow and Clyde. Ethics approval West Glasgow Ethics Committee.